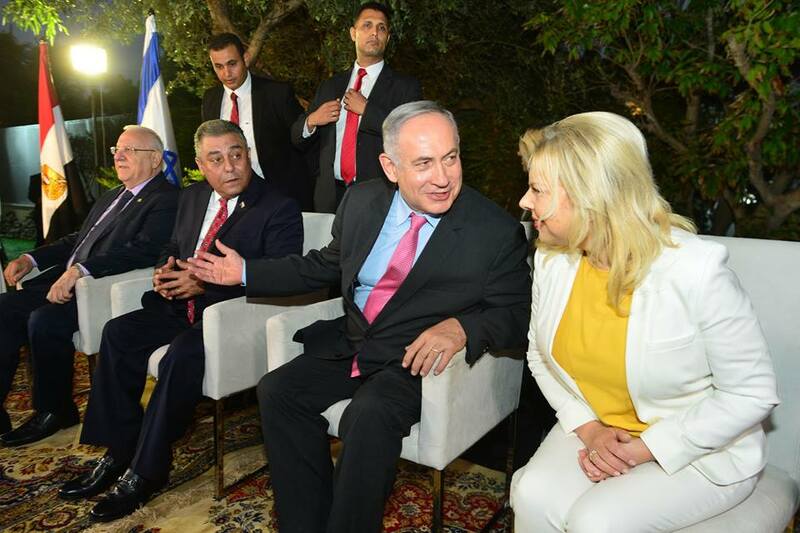 From left: Israel’s President Rivlin, Egyptian Ambassador Khairat, Israeli Prime Minister Netanyahu and Sara Netanyahu. Israeli Prime Minister Benjamin Netanyahu praised Egyptian President Abdel Fattah Al-Sisi for his leadership and his efforts to advance peace between the Israelis and Palestinians during a celebration of Egypt’s National Day. “I want to thank President a-Sisi for his leadership and for his efforts to advance peace between Israel and the Palestinians and in the broader Middle East,” declared the Israeli Prime Minister on Thursday. In a speech given at the residence of the Egyptian Ambassador to Israel in Tel Aviv, the Israeli Prime Minister said that Egyptians and Israelis have “so much” that they can accomplish together. “We have so much that we can accomplish together. We can work, and are working together in agriculture, and we can work in water, in energy, in every field of human endeavor to make the lives of our peoples and the lives of peoples in the Middle East as a whole better, more secure, richer. A future of hope, a future of prosperity, and a future of peace.” said the Israeli Prime Minister. Egypt’s National Day event was also attended by Israeli President Reuven Rivlin, opposition leader Yitzhak Herzog, and members of Israel’s Knesset. Netanyahu’s statement at the event comes weeks after Egypt’s Foreign Minister Sameh Shoukry made a rare visit to Israel in efforts to advance peace talks between the Israelis and Palestinians. In a speech in May, President Sisi said there is a “real opportunity” for peace, stressing the importance of the international community in reaching a solution. “I am saying to the Israelis that there is a real opportunity to achieve peace,” the President said, while stressing that Egypt is prepared to exert all efforts necessary to resolve the long-standing conflict. Egypt’s President Sisi has enjoyed a positive relationship with both the Israeli government and the Palestinian Authority in the West Bank. In Gaza, Hamas has been attempting to thaw its relationship with Egypt after resistance following the ouster of former President Mohammed Morsi in July 2013, who was strongly backed by Hamas.